You hide yourself because you age? Aging is a normal process. We are all going to age…then die…then go on to be judged. Yes, of course, everyone is aging. I started to see some upsetting signs at age 37—the sort of vintage that appears when aging delivers its first crushing blow to a lot of us. I recall that getting ready to go to church, work, a party… anywhere, really, became a rather trying experience. Every woman is familiar with that final check she’s got to do and the approval she needs to receive from the mirror before she leaves. For some, the presence or absence of this final approving feedback from the mirror makes the difference between a confident day and a lousy one. The woman herself must like what she sees. However, the day comes when a woman finds she can’t get the approval she wants, no matter how much time she spends putting herself together. She looks in the mirror and sees a sallow complexion, droopy eyelids, bulges, puffiness. Where did they come from? No make up or camouflaging clothes can help. Comedians joke about the woman taking endless hours getting ready to go out, while the man simply waits. It’s really she who waits—for the mirror’s approbation, which never comes. That’s what I saw. I wanted to change. And the solution came. Fast forward… At 39, I found raw foods. Everything changed. For the 20 years since then, I’ve been getting a new kind of affirmation from the mirror. So I am convinced, my diet suggestions and beauty tips will slow down aging for you considerably. Because there’s nothing wrong with aging slower than what’s considered “normal,” and having a pleasant appearance, when done in good health. You develop an appreciation for the life you’ve led and even an appreciation for death itself. It’s true, aging speeds up with every passing decade. I’m at a place where it’s pretty darn difficult to improve my diet. And I don’t want to make my beauty routine any more elaborate than it already is. So what now? What else can help? Here is my recent video: The Biggest Anti-Aging Secret. It’s not about skincare. It’s not about a new beauty device. It’s about something that costs nothing, yet is very powerful in keeping you youthful, no matter what your age. I hope you’ll take some advice from both this lady and me. 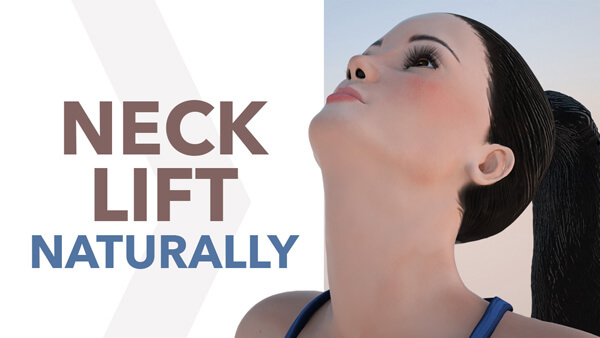 Make neck exercises part of your daily facial fitness training! Practically speaking, aging starts with the neck. It’s a universal truth. Necklace lines. These horizontal lines going across the neck look like a row of necklaces. They can begin showing as early as your 20s and 30s. Bunching neck cords. Also called platysmal bans, these become ever more prominent with age. Turkey neck. This is an apt—if unattractive—name for that excess of skin that hangs just under your chin. All these problems, whether actual or merely potential in your own case, can be addressed by the three exercises mapped out for you in this video. The exercises are designed expressly to smooth necklace lines… relax the platysmal bands… firm the underlying structure to smooth out the excess skin. The sooner you start, the better: These conditions are easier to prevent than reverse. So get to work now. We all know it’s important to brush your teeth every day… For anyone who wants dewy, fresh, blemish-free skin, it is equally important to apply a facial mask every day. Clay masks are my personal favorite. Men and women should both cleanse their skin to keep it robust and healthy. It’s never too early to start. You’ll be glad you did once you get to be my age. Now that I’m nearing the big 6-0, I’m taking a close look at what I’ve believed, past and present. One thing I’ve definitely gotten right: When you look and feel younger than almost everyone in your peer group, aging doesn’t feel bad at all. Improve Your Skin in Just a Few Minutes with a Facial Mask.